Tear up the bread and place it in a bowl. Pour over the milk and allow the bread to soak for about 5 mins. Place the roe on a board and use a sharp knife to split the skin across the roe. Take a spoon and carefully scoop out the tender roe into a large bowl. Squeeze out the excess milk from the bread and add the bread to the roe along with the garlic. Use a wooden spoon to vigorously beat this mixture together. Gradually whisk in the oils a little at a time – the principle here is similar to making mayonnaise. Add the lemon juice and taste (it shouldn’t need seasoning). You can also use a food processor, which will give you a thicker consistency. If it becomes too thick you can loosen it with a splash or two of warm water. Bring a large pan of salted water to the boil, add the broccoli stems and simmer for just a few minutes. They want to retain a slight bite to the stem. 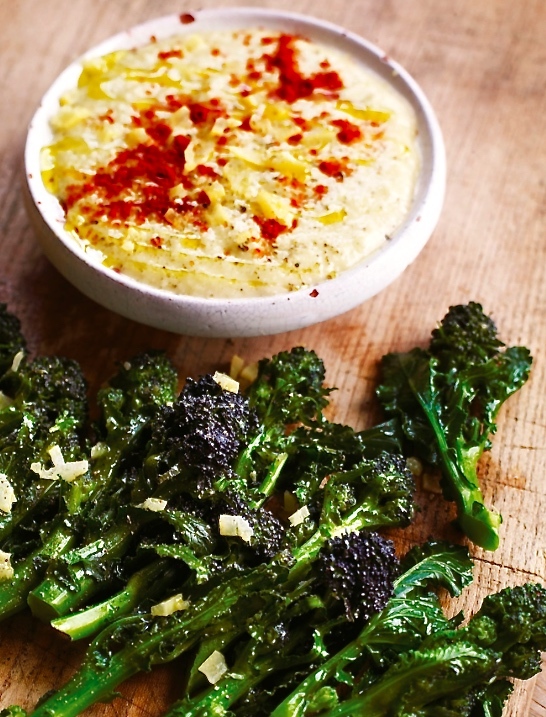 Serve the broccoli alongside the taramasalata with a sprinkling of chopped preserved lemon, a dusting of smoked paprika and a good trickle of your best olive oil.